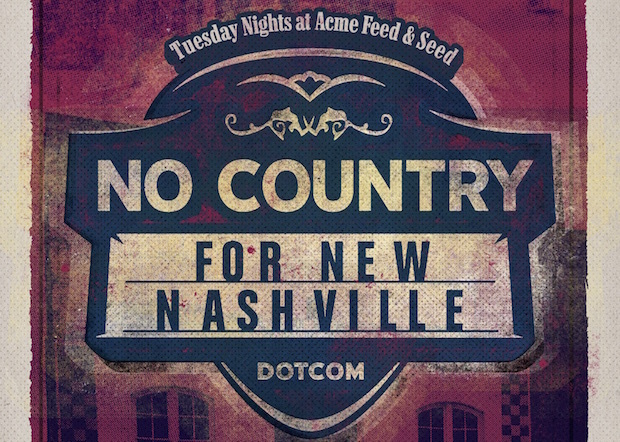 We’ve officially kicked off the 2017 season of our long-running showcase series at Acme Feed & Seed, introducing a new format that will include rotating DJ sets ahead of largely two-band bills going forward. Our next show will be taking place Tuesday, Feb. 28, with genre bending indie rocker Diamond Carter and friends in the headlining spot, cinematic pop performers The Daybreaks, plus Acme Radio holding down the DJ booth when things kick off at our usual time of 7 p.m. Read on for a full preview and we hope to see you at the show. A fixture in the Nashville rock scene for several years, and one of the first acts to help us kick off our Acme partnership way back when in 2014, we’re excited to welcome local singer-songwriter Diamond Carter back to Acme, as he appears to be rounding up his backing players and gearing up to have a much busier 2017. We would have just said he “got the band back together,” but the lineup has always been fluid. Other than a self-titled, country leaning EP he released last year, and some scattered gigs, we didn’t hear as much from Carter in 2016. However, as of this year, he has resurfaced with a live weekly show, Sunday Happy Hour with Diamond Carter, broadcast live on Facebook. In the web show, DC and friends perform songs every week form The East Room, and they’re all worth checking out! As for the return at Acme, your guess is as good as ours as to who will be there with him and what they’ll play. Possibly some of the stuff from his latest EP, maybe even some all new tracks, both are fair game, but based on everything he’s ever shown us so far, we’re sure it’s going to be great! Don’t miss a local staple’s magnificent return to our Acme showcase. A relatively new local band, formed in early 2015 during songwriting sessions between Kaleb Jones and Heather Bond, The Daybreaks officially began to materialize in early 2016, once they got Adam Bokesch and Zac Stred (of Milktooth) to play on the recording and form the live band. The first single, “The Machine,” was soon to follow, and not long after that we helped them premiere a live video for a cover of Bananarama’s “Cruel Summer”. Their sound screams ’80s in the best ways possible, with cinematic pop songs destined for greatness. With the momentum they’ve been building, we fully suspect they’ll be another break out Music City success story sooner than later. Catch them live for free now, while you still can! Diamond Carter and The Daybreaks will perform Tuesday, Feb. 28 at Acme Feed & Seed, with a DJ set from Acme Radio to start. The show is 21+, begins at 7 p.m., and, per usual, it’s totally FREE!